So today I’m gonna talk about Baretta, the fire Sylph. I recently six-starred him and I regret not fusing him sooner. He’s a four star monster and undoubtedly one of the real MVPs of ToA. Baretta can also be used as fusion material for Katarina, but here we’re going to talk about how to actually use him. Out of all the four star monsters you can fuse, Baretta is undoubtedly the best. As per tradition, I’m going to show you my runes and stats on him, and then we can get on with it. Baretta can be easily fused, and is part of the Katarina fusion. You may be wondering why I’m talking about him. I’ve already mentioned him in an earlier article, about Trial of Ascension, but now I’m really going to go in-depth about using your Baretta. His first isn’t really much to look at. He attacks one enemy, and increases his Critical Rate for 2 turns if he gets a critical hit. Moving on, we have his second skill, Turbulence. It will attack one enemy and then completely reset their attack bar, making this skill great against bosses. Finally, we have his best skill, Phoenix’s Fury. When awakened, he can summon an AoE attack that can inflict not one, but two Continuous Damage effects on all enemies! This is undoubtedly a very good skill, not to mention that as leader everyone’s speed gets a 19% boost. I’m…actually not too sure where to use Baretta early-game. To give you some context, early-game would be before you get a stable GB10 team. You can’t take Baretta to GB10, because he’s a fire Sylph in a water dungeon. He’s also not that good of a Faimon farmer; considering he only has one AoE skill and he isn’t really known for his attack power. 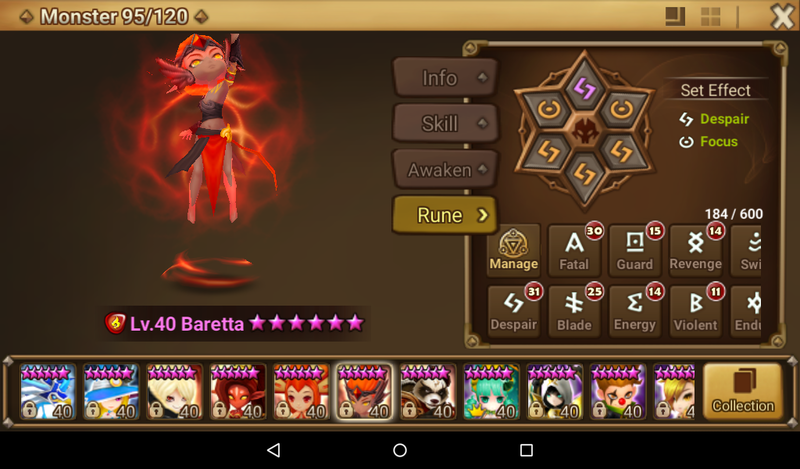 If you do get Baretta early-game, I guess you should rune him on Swift/Energy as an early build. The optimal stats would be SPD/HP%/HP% and try to get his accuracy up to 45%. Again, I don’t know where you’d use him early-game, but I guess you can figure that out yourself. This is probably when Baretta gets the most use. I can see people using him as a +1 in, say, a DB10 Tower Team or something. However, his main use is in the Trial of Ascension. Some late-game players even still use him there to this day. It should be here that you’ve gotten a stable GB10 team, and are steadily progressing towards fusing Sigmarus and starting your DB10 team. If you are going to use him in a DB10 Tower Team (not sure why you would do it but to each their own), you’re mostly going to be using him for his ATK bar reset, speed lead and DoTs. The reset would be perfect for slowing down the right tower which you should focus on, and the DoTs can easily kill the tower without directly attacking it to death. The DB10 boss won’t take revenge if the tower dies to DoTs. Baretta can also be pretty good for Secret Dungeons. Like Trial of Ascension, Secret Dungeons are all about AoE attacks, attack bar resets, and Continuous Damage, meaning Baretta is going to be a shining star, that’s for sure! Here, I would recommend using Despair/Energy or Focus if you have the Focus runes somehow. Again, SPD/HP%/HP% and 45% Accuracy. Like early-game, I don’t know where you could use Baretta late-game. I’ve seen some mid-game people use him in Arena for his pretty decent skillset + speed lead, but other than that you should have some better monsters at that point to the point where you don’t even need to use Baretta late-game except for the Trial of Ascension. Use the same runeset as before. I’d personally say that “yeah, skillups are pretty good” When Baretta’s second and third skills are fully skilled up, his second, Turbulence, is only three turns. Phoenix’s Fury is four. However, unlike Olivia, he doesn’t absolutely need skillups to be useful. Sure, you may not get as many DoTs as often as you’d like, but other than that he’s okay on his own. His main use is only in Trial of Ascension and in Hall of Heroes sometimes. Hall of Heroes works very similar to ToA, and such have the same methods of dealing with it that ToA does: DoTs, stuns, attack bar resets. Since Baretta is a ToA monster, he’d be good in HoH too. Trial of Ascension is an obvious choice for everyone. After all, you’ve probably read on many tutorials that stunlock and Continuous Damage is what wins a ToA stage; making sure to get as little hits on your monsters as possible. In other words, go use your Baretta in ToA. You may be wondering “Why am I even comparing Baretta and Zaiross?” It’s because they have a somewhat similar skillset. Of course, their skills cannot truly be compared, but I figured we would do a comparison of the ups and downs of both of them. Zaiross can actually be almost a Baretta replacement in ToA. Of course, he still doesn’t have the single-target attack bar reset, but nevertheless, they deserve to be compared. Either way, both monsters have their ups and downs. However, if it were up to me, I’d say Zaiross is better; however, that doesn’t mean that Baretta isn’t great too. I’d definitely use the both of them if I actually had a Zaiross. I’m Sara Ann, and I’ll see you in the next article!